Near the beginning of training, our Medical Officer Teuila showed us a graph somewhat similar to the one at left. I can’t find the actual one she showed us, and mine is a terrible reproduction, but it captures the essence of what I took away from hers. According to my ears, the overarching point was the Peace Corps is an emotional rollercoaster that has ridiculous ups and downs at the beginning, but which evolve and become more elongated as time goes on. And any time you cross the x-axis, your chances of going home early become higher. At Volunteers en Masse events, we often recall this chart and talk about how accurate it was. Teuila’s chart also had a more specific timeline. There are specific moments in the life cycle of a volunteer when most cross the line: the first couple weeks of training, after 1 month, after 3 months, after 6 months, after 12 months, and after 24 months (I’m reciting all this from memory, so take it with a grain of salt.). And as group 81 has passed each of these milestones, we’ve noticed the collective mood swings. 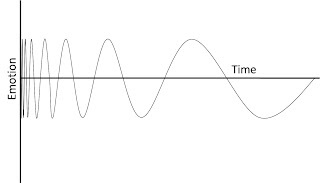 I bring this up because this morning I made arrangements to hang out with two people, one midday and the second for dinner, who are having particularly difficult times crossing the x-axis at their respective points. The back-to-back scheduling was a coincidence, but I worried a little about what this one-two punch would do to my psyche. The first was a fellow member of Group 81. My group just hit our one-year mark, and most of us should be crossing the x-axis in the next couple months. We’re at the point when a lot of factors are coming to a head: our first year of school is coming to a close, many volunteers are going home for Christmas, stuff is starting to feel re-hashed, the excitement of new things has dwindled. Though we’re just about halfway through service, there’s a feeling of culmination in the air right now sort of like the kicking a field goal right before halftime, or bringing down the house just before the end of Act 1. And people are getting antsy about coming back after intermission. Conversation went as well as can be expected. Dinner tonight was with an outgoing member of Group 82. I’d say the first 4 months of the Peace Corps are the most difficult, as is demonstrated in the frequent ups and downs in the graph. The days are so long, and going to bed with the satisfaction of getting through the day is erased the next morning when facing another day is daunting. There’s adjusting to the new place and the new climate and a new set of friends. Then adjusting to the host village. Then adjusting to training and having your hand held. And when you’re finally adjusted to all that, you’re kicked out of training and there’s a whole new round of re-adjustment at your permanent site. All feelings are tentative, and the ups and downs and loop-the-loops can be nauseating. It’s not uncommon for people to want off the ride. Once again, conversation went as well as can be expected. The encouraging thing was the two conversations forced me to assess my own situation, and it seems like I’m doing okay. I like my job, I like my site, I like Samoa. There’s a constant feeling that any state of mind in the Peace Corps is temporary and tentative and that line-crossing can come any time, but today things were good. 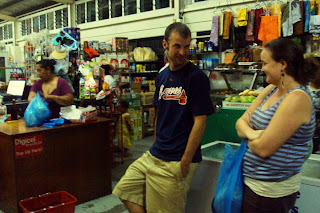 Jordan and Briony laughing at Lynn's faleoloa. 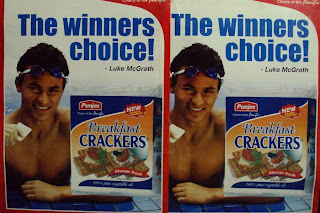 Luke McGrath and his posters advertising Punjas Breakfast Crackers are all over Samoa. Dude isn't listed in Wikipedia nor on the first page of "Luke McGrath" hits on Google. He is wearing goggles in the picture and by googling "Luke McGrath" AND swimming, I found out Luke McGrath is a reasonably talented ocean swimmer from Fiji. I'm happy that you like your job, your site, & Samoa. We are all very proud of you! I'm also happy that you are doing okay. It's hard enough having you so far away. If you were really unhappy I couldn't stand it! Matt - interesting that she graphs it and preps everyone to expect emotional highs and lows. Nice hint for folks to know it is ok and that she is observing all behaviors. Definitely, you all have had reason with the tsunami & earthquake. We felt the highs and lows thinking of you too. It is good that you get by on koko samoa :) I would also like to point out that having checked Koa's blog, the group seems to have had some fun with the red hat, IMHO, you are quite dashing in it. Will you be going home for holiday? Just wondering. I am glad you like your job and that you have taken this time to be a PCV. Reading your blog has been a fun and cultural learning experience. Wishing you all the best and thanking you for writing. Malo lava Matt! There's not a Samoan on the rock who wouldn't adopt you as their 'palagi' cousin from the Bay area. Especially the fafafines of Apia ha ha ha (jokes). It's difficult to imagine how you and your colleagues can step off the treadmill of your regular life to serve as a PCV, so far away from everyone you know and love. The closest experience most Samoans will have of this, is when leaving families behind to study abroad or migrate for better opportunities. The novelty eventually wears off, the grind sets in and mixed with homesickness make many check out earlier than expected. Some never even make it past the heady orientation period, catching the next plane back drunk on euphoria and regret. However most remain on, coping by adapting to local ways, adopting new family of friends, resolving to go ahead to experience this fish outta water sensation, which eventually ends all too soon when least expected.